Meet my few food obsession: Cauliflower Tater Tots. With a crispy exterior and fluffy, tender interior, you won’t believe that these tots are tater-free! When it comes to replacing flour or potatoes, I’ve come to rely on cauliflower with great results. It provides a wide range of textures with a pleasantly sweet but not distinct flavor. One of my favorite uses for cauliflower is my flourless Cauliflower Wraps. This recipe started out as an attempt at cauliflower fritters but I found that when made thicker and smaller, it replicated tater tots. I love that this recipe requires no deep frying. I’ve seen many recipes for homemade tater tots that call for deep-frying in coconut oil, which eliminates the unhealthy aspect of frying in vegetable oil. Still, I find deep frying intimidating, expensive and time consuming. I much prefer this easy pan-fry method. You can enjoy these cauliflower tater tots plain or with your favorite dipping sauce. Homemade ketchup would make a more traditional pair, but I whipped up an easy Lime Avocado Sauce for dipping. You only need an avocado, a lime and a pinch of salt! Cauliflower, the star ingredient, replaces the potatoes with a shockingly similar texture and flavor. It creates a moist, tender inside with a crispy crust. Eggs work as the binder and allow the inside to become tender and fluffy. Egg substitutes will not work in this recipe. Coconut flour is my flour of choice for grain free baking. It plays an important role in the cauliflower tater tots by absorbing excess liquid to prevent soggy tots. The whole recipe uses only 4 teaspoons of coconut flour, but even though it’s a small amount, it is important. Tender inside and crunchy outside, these taste surprisingly like "real" tater tots! 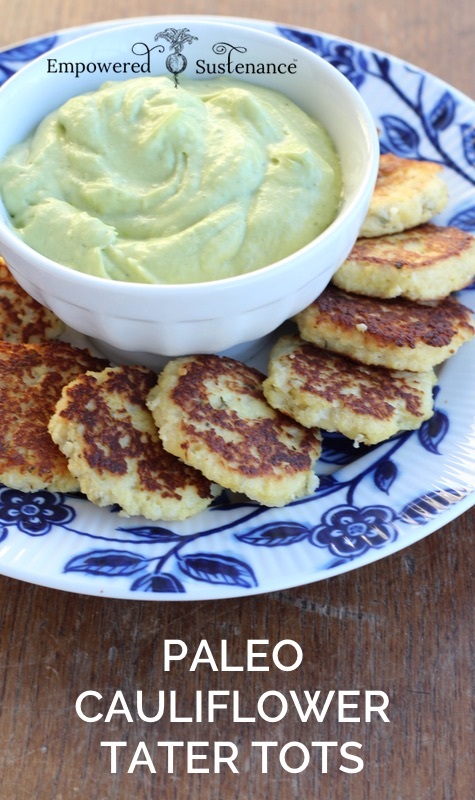 Use with your favorite dipping sauce but my favorite is this Lime Avocado Sauce. Piece the cauliflower into florets, then place the florets into a food processor. Pulse for about 10 seconds, until it resembles fine grains of rice. In a large skillet, heat the 1 Tbs. of oil over medium heat. Add the crumbled cauliflower, stir to coat, then cover and cook for 2-3 minutes. Remove the cover and cook for another 2-3 minutes, until softened. Turn off the heat and let cool until no longer hot. Optionally, transfer the cauliflower to a bowl, but I prefer to save the time and I mix up the batter right in the skillet. Add the coconut flour, eggs, salt, and optional Herbes de Provence to the cauliflower mixture and stir until well combined. Heat another skillet over medium heat and add a spoonful of cooking fat to coat the bottom. To make the tater tots, I highly recommend using a mini ice cream scoop, which is also called a "cookie dough scoop" and you can find it here. This is an easy way to get uniformly-sized, ideal-height tater tots. Using the scoop or just a spoon, drop the batter onto the hot skillet. If using a spoon, use ½ Tbs. of batter per tot and make it about ½ inch thick. Add more fat to the pan and repeat with remaining batter. Enjoy while warm with optional Lime Avocado Sauce. 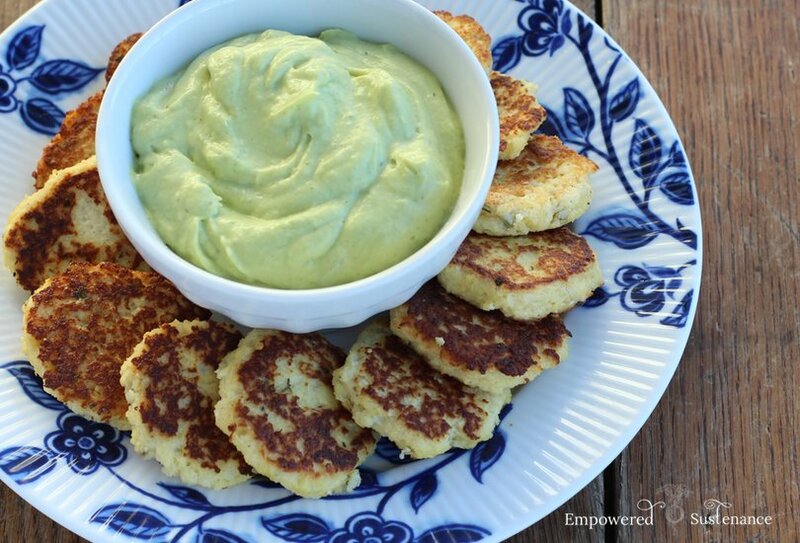 To make the avocado sauce, blend the ingredients in a food processor until creamy. Tots are best within an hour or preparing. Store leftover tots in an airtight container in the fridge and warm briefly in a skillet or in the oven before serving. Feel free to double the recipe, but you'll need a large skillet to cook the whole cauliflower in one batch. If necessary, you can cook the cauliflower in batches if it doesn't fit into your skillet. Do you use cauliflower as a potato replacement? What is your favorite use for cauliflower? Thanks for this, I’ve just made it, was a bit odd as only had half a cauliflower and didn’t think to half the rest of the ingredients, too hungry, couldn’t think straight, but hey, they were great! My daughter has had a reaction to potatoes for years, so she hasn’t been able to eat them. I made these last night, and she almost cried! She said they tasted just like potatoes! I didn’t have coconut flour, so I added tapioca flour and Adobo instead of the seasoning mix, but they were great! She didn’t even want the avocado dipping sauce! Thank you! a wonderful recipe indeed!!! doing Gaps diet with my daughter- she is so thrilled to have these as a tator tot substitute!! we have also found that celery root makes a great faux french fry!!! Blessings! !